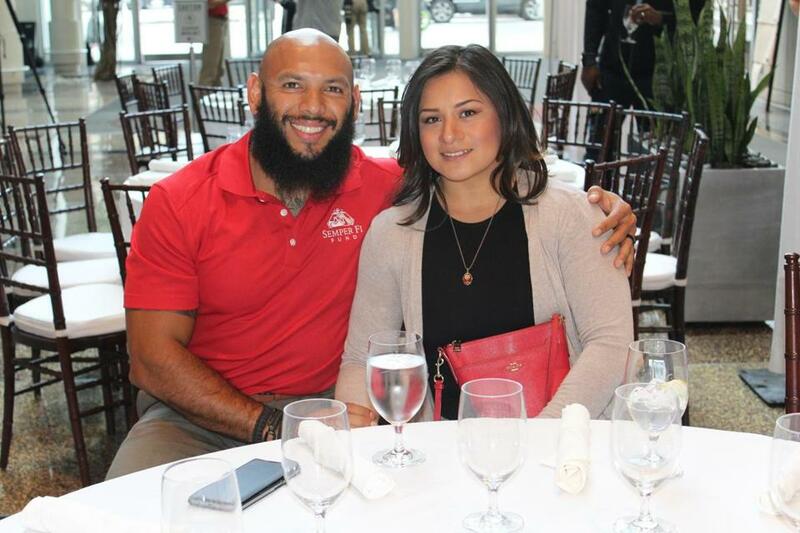 Jose Sanchez with his wife, Dulce, at Davio’s in the Back Bay Sunday. The first-place finishers in the 2017 Boston Marathon — Geoffrey Kirui and Edna Kiplagat — celebrated their victories at Red Lantern in Back Bay Monday night. . . . Jose Sanchez, the inspiring Marine who completed the 26.2-mile course on one leg while holding an American flag signed by fellow military veterans, fueled up for the marathon on Sunday night with his wife, Dulce, at a pre-race dinner at Davio’s Northern Italian Steakhouse in the Back Bay. Davio’s owner Steve DiFillippo hosted the dinner for Team 4-15 Strong, which was made up of marathon bombing victims, and Team Semper Fi, a group of wounded warriors, and their families. Special guests who stopped by to show their support included BAA Executive Director Tom Grilk, former Boston Police commissioner Bill Bratton, and former FEMA regional director and Boston EMS chief Rich Serino, now a distinguished visiting fellow at Harvard University School of Public Health. . . . Tampa Bay Rays first baseman and designated hitter Logan Morrison, affectionately known by his nickname, “LoMo,” was seen having dinner at Scampo at the Liberty Hotel on Sunday. . . . Later that night, after their victory over the Celtics, Chicago Bulls players Dwyane Wade and Jimmy Butler dined at Strega Waterfront, while former Celtic and current Bull Rajon Rondo, along with other Bulls players, dined at Strega North End.